On the road, preparing to close another deal with corporate executives, Grier is today the savvy Chief Executive Officer for META Security Group, a North Carolina-based company that ensures corporate intellectual property remains proprietary by delivering Internet/intranet security solutions. While most guys his age are eyeing the corner office, dreaming of their shot As a someday As a at calling the shots, Grier is already there, running a growing company. But on the phone, from Ohio, Grier was taken back to his days at ECU, and how his decision to be a Pirate led to the chance encounter that put the former quarterback on his current track. Though many choices seem innocuous at the time they are made, there are those that in hindsight made all the difference. 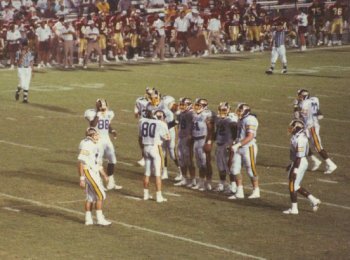 It was Grier’s decision in 1988 that, at least for some time, the former quarterback regretted. But as time wore on, Grier realized the choice he made then, though effectively ending his football career, was the decision of a lifetime. 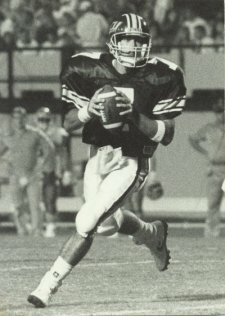 In 1988, Grier had just wrapped up a strong season as the starting quarterback at Division I-AA Richmond. He had led the Spiders to a No. 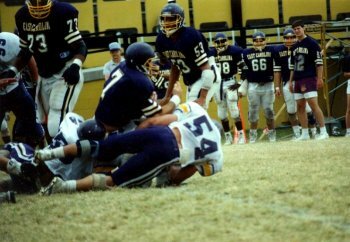 13 ranking and was poised to finish out his career as a three-year starter. But, Grier, who lives for the challenge, was not fulfilled in the role… he wanted to see how good he was. “I played as a freshman and started as a sophomore (at Richmond),” he said. “We won the conference, and were 13th in the country. It’s a great school, but I wanted to go to a big school. Everyone in Richmond thought I was from Mayberry or something. I tried to convince them that Charlotte is a real city, but…. Really, it was a great experience for me; I just wanted to play (big-time) football. So Grier reached back a little to some high school connections. “I met coach (Art) Baker at the Gus Percells quarterback camp when I was in high school,” the former Charlotte Latin star said. “But (ECU) seemed unlikely with Baker, because I was a passer. ECU, seemingly out of the picture, became a true possibility for Grier when Baker introduced him to the Pirate offensive coordinator, Kevin Gilbride. "Me Running Over Ken Burnette (54) During Spring Game"
While Grier got acclimated to the offense and prepared to make a run at the starting role, the worst thing that can happen to a transfer — short of a career-ending injury — happened. “After that season, Baker and the entire staff was fired and I had to start over with Coach (Bill) Lewis,” he said. Even with the coaching change, Grier finished the spring listed as co-starter with Hunter. But, after his grandfather died and he took some time off, Grier slipped down the depth chart behind Hunter. Still, Grier did get on the field quickly that season when, in the opener, Hunter went down momentarily. Though ECU was not the ticket to the NFL that Grier once hoped it would be, it was where he found his future — in more ways than one. And through all of the ups and downs, Grier’s sense of humor, above all, may be the very mechanism that has allowed him to find success in the unlikeliest of places. 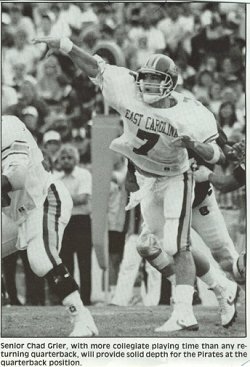 Though, if you ask him, his contribution to the ECU football program was more defined by a mano-a-mano, battle royal, ongoing spy-versus-spy relationship with former punter Tim Wolters. 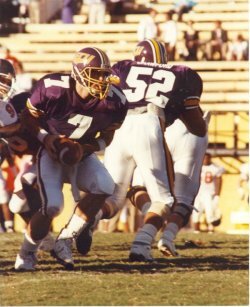 During their time at ECU, the two engaged in a battle of pranks that reached legendary status. Still today, Grier can’t resist the chance to take a shot at his old nemesis. 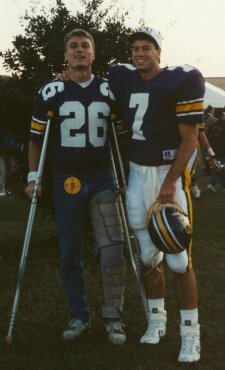 The two are still close friends and the relationship was just one that Grier fostered at ECU. And for that reason, among others, Grier finds it hard to regret his decision to transfer to ECU. And it was at ECU, where his real family started. “I met my wife, Elizabeth, there,” he said. “There was a walk-on named Keith Stevens, we all called him ‘Shed.’ I don’t think he even had a number. He was from Apex and my wife is from Raleigh and they knew each other. She is a twin and Shed would go out with her sister. He introduced me to her and, honestly, it was pretty uneventful. "The next time I saw her, she was in a bikini winning a contest and $1,500. That night, I saw through her external façade and saw the truly wonderful person she was on the inside and a three-year courtship began. Really, it was her inner beauty that attracted me to her. Grier and wife, Elizabeth at Disneyworld. What a cut-up! And she has, more than money ever could. It’s not surprising that his three boys, Will, Nash, and Hayes, are the biggest things in his life. His father, Benjamin Hayes, took a deep involvement in his son’s life. 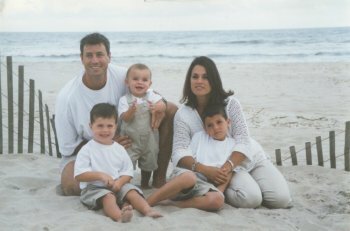 From his father’s influence, Grier has become deeply involved in the Fellowship of Christian Athletes (FCA) because, it was “what he stood for.” And he is involved in youth sports in general. He and Larry Jordan As a yes, Michael’s brother As a have forged a close friendship, co-coaching young kids in basketball. And, from his mother Carol, he gets that goofiness that has served him well throughout his life and athletic career. The humor got him through what would have, in most cases, driven a player to pack it in and not see it through to graduation. With Art Baker’s departure, so went Grier’s support system, particularly Mark Richt. The transition announced the end to Grier’s chances of ever really seeing the field. “Let’s just say we were philosophically opposed,” Grier laughed. “Philosophically, he thought I sucked and I thought I was OK.
"But coach Logan was a funny guy… really. He used to say that the only way I could run a 4.5 was to fall off a building. Grier was a smart guy and it was that nose for success that created an unlikely chain of events, landing him, today, in the CEO seat of an emerging company. That first opportunity was with Carolina Telephone, working in sales out of Kernersville. That job gave way to a job with Sprint which was then purchased by United. The next nine years brought Grier to the level of division director. “I really got lucky, working for some very smart people,” he said. Grier then gambled by jumping to Blue Star where he was an executive vice president of sales for the DSL start-up. After integrating the two companies, Grier opted to move on, heading to his current position as the CEO at META Security Group. “This year I call tuition because I couldn’t afford to pay for what I’ve learned in the last year,” he said. “We have a real market-leading product. We are a consulting company and have a product. “I have a decent piece of equity and I’ve seen a lot. Every job I’ve had, I’ve been fortunate. When I went to Richmond, all I ever wanted to be was an NFL quarterback. I’ve made tons of mistakes, but God has led me to the decisions and things tend to work out. He’s given me wonderful opportunities. Things really can’t get much better these days for Grier — and he knows it. Looking out that Ohio window, Grier is once again reminded of his family at ECU. "World's Worst Black Basketball Player."